The Gitzo G1588 Carbon Fiber Monopod is probably the absolute best 4-section monopod available - or I should now say "was" as it has been replaced by the Gitzo GM5540 Monopod. Construction quality of the G1588 is excellent. Fit and finish are superb. 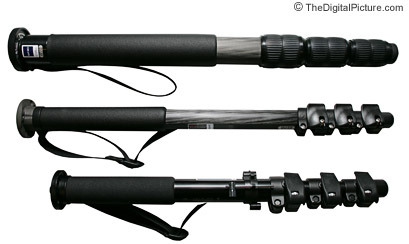 Carbon fiber monopods weigh about 30% less than equivalent aluminum models. The Gitzo G1588 Monopod utilizes carbon fiber for its light weight, strength and rigidity. At 2 lbs, the Gitzo G1588 Carbon Fiber Monopod is actually heavier than the Bogen 680B (Manfrotto 3249B) Monopod. But the Gitzo G1588 is rated 4.5 lbs heavier than the 680B (26.5 lbs). The G1588 is noticeably stiffer as well. The G1588 is also thicker than the Bogen 680B (Manfrotto 3249B) Monopod - and much thicker than the Bogen 349 (Manfrotto 3449) Carbon-One Monopod. The Gitzo G1588 retracts to 22.8" - about the same as the other 4-section tripods I refer to. Pictured above from top to bottom are the Gitzo G1588 Mountaineer Mk2 Carbon Fiber Monopod, the Bogen 349 (Manfrotto 3449) Carbon One Monopod and the Bogen 680B (Manfrotto 3249B) Monopod. And as you would expect, the G1588 also costs significantly more than most other monopods. The Gitzo G1588 Carbon Fiber Monopod can handle the largest Canon EF lenses including the Canon EF 600mm f/4 L IS Lens. The twist-locks on the G1588 adjust very smoothly. It is easy to get just the right monopod length set by letting the last section adjust slightly as the last twist-lock is being tightened. Utilizing fully-round legs, the hand pad fits very well. The G1588's hand strap rotates. The foot is very grippy. Mount a Wimberley Quick Release Plate and possibly a Bogen 3232 Swivel Tilt Monopod Head the G1588 for an excellent setup. As of the date of this original, I think the Gitzo G1588 Carbon Fiber Monopod was as good as it gets for monopods. If you want the best, get the G1588. You will not likely want to replace it for a long time. As I said in the beginning of this review, the Gitzo GM5540 Monopod is the new and improved model of this monopod.